Heat oven to 350°F (325°F for dark or nonstick pans). Grease and lightly flour or spray bottoms only of two 8-inch or 9-inch round cake pans. In large bowl, beat cake mix, water, oil, eggs and pineapple (with juice) with electric mixer on low speed 30 seconds, then on medium speed 2 minutes. Stir in nuts, coconut and raisins. Pour into pans. Bake 8-inch rounds 40 to 45 minutes, 9-inch rounds 30 to 35 minutes, or until toothpick inserted in center comes out clean. Cool 10 minutes. Run knife around sides of pans to loosen cakes; remove from pans to cooling rack. Cool completely, about 1 hour. Place 1 cake layer, rounded side down, on serving plate. Spread with about 1/3 cup frosting. Place other layer, rounded side up, on top. Frost side and top of cake with remaining frosting. Store covered in refrigerator. 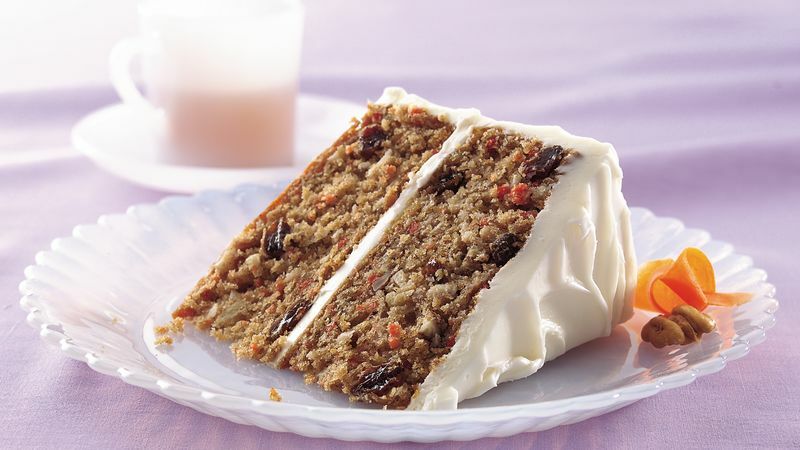 Select your favorite type of nuts for this fabulous cake - pecans, walnuts, almonds or hazelnuts work great!